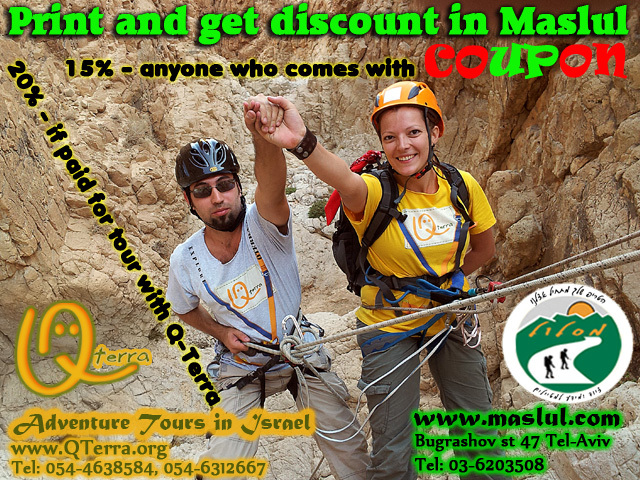 Welcome to Adventure Tours in Israel! What are adventure tours in Israel? It's a great mix of interesting excursions, exciting trips and incredible attractions. But what makes our tours in Israel really adventurous is the atmosphere, the unusual places, the funny moments and unforgettable memories. If you're looking for some really enjoying and memorable trips - you're in the right place! Our adventure tours in Israel are suitable for everybody! Either for those, who want to see the famous places of Tel-Aviv, Jerusalem, Dead Sea, Galilee and get a tan on the beach, and for those who love to be in the places less visited by tourists and try to add some real action flavor to their trip. That is why we offer combined adventure tours in Israel. You can visit the unique salt cave Colonel in the Dead Sea using the rappelling and also get a nice and a bit funny swim in the salt Dead Sea waters. You can join the exciting water canyoning tour in Black Gorge canyon hidden in Golan Heights with marvelous waterfalls and wild green around and get a beautiful tan and rest in the nature at the same time. These rappelling adventure tours in Israel are one of a kind and are going out on a regular basis every week whole year round. You can also see our active leisure tours in Israel that include paragliding over Israel's coasts and mountains, horseback riding in Jerusalem hills and Mediterranean sea shores, yachting, diving for newbies and experienced divers in Caesarea's first in the world underwater archeological museum. We also have scheduled weekend tours in Israel that you can join at the fair price. 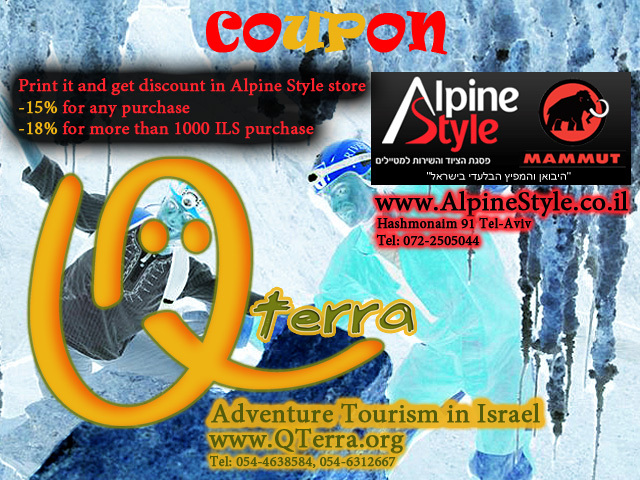 All Q-Terra's regular tours in Israelare "all included", covering every aspect of a high quality and professional activity. Transportation, certified equipment, insurance, professional instructors – all is covered for you to enjoy the tour at its best. For those who look for adventurous and interesting excursion, we have specific quest tours in Israel. You can read all about them in our "Adventure tours" section. These excursions include elements of a quest game in "treasure hunt" style. You will be amazed to see how history can come to life right in front of your eyes by seeing the great historical sites from a slightly different point of view. All our adventure tours in Israel are exclusive, made especially for tourists, families, groups of co-workers and friend. We do our best to provide the most memorable and exciting adventure in Israel for you and would be happy to see you around! Getting interested? Looking for something different? Wanna reach places others can't? Well, then we wish you a pleasant travel on our website and wait for you on our tours in Israel!